Toad in the Hole, the most popular and traditional of childhood English dishes, is nothing more than sausages cooked inside of a Yorkshire Pudding batter (batter similar to American popovers). Having not lived in England for a while now, I don’t know if its popularity has waned or not, but back in the day, it was a popular presence on many tables for evening tea. The origin of the funny name is a matter of discussion, but traditionally refers to the sausages resembling toad or frogs peeking out (I personally don’t see that at all, but that’s me). Food history claims that it wasn’t always sausages that were cooked in the batter but any kind of leftover meat. I’m thinking that all the leftover meat started ending up in delicious shepherds pies and cottage pies and they started using bangers to add to Yorkshire pudding batter. The the best part of the Toad in the Hole is the Yorkshire pudding and I would find plenty of excuses to make it as often as possible. To top it all off, I never ate this in England as a child. It wasn’t made at my home and it wasn’t a restaurant staple, and even if it was, I couldn’t eat it. Indian cuisine isn’t much for sausages and the like, though we do have dried kebabs and meats. So, growing up there wasn’t much in the terms of bangers and mash, or toad in the hole or even sausage rolls (not to mention most of these were pork based which we don’t eat). Here’s the wonderful thing about growing up and having your own kitchen, you can cook what you want! All the things I couldn’t have as a child but was so curious about and yearned to try, I have remade with substitutions for my children and in the process, satisfied every one of my cravings. The reason I chose to share this is because I didn’t post any Halloween recipes. As a child, Halloween wasn’t a common holiday in England and so I never participated. I was an adult when I moved to America so still, it wasn’t a holiday that interested me. As a mother, I just didn’t encourage the whole Halloween thing and my children have never taken part in anything Halloweeny. That’s a decision we made as parents, and I have my own ideas but I won’t get on my soap box today! There was no Halloween in the UK back then but it seems to be thriving today. What we did have; Bonfire Night or Guy Fawkes Night which commemorates the unsuccessful attempt by Guy Fawkes to blow up the buildings of the House of Commons on November 5th, 1605. So, come November 5th, I would insist we go to the bonfires held in parks or open air fields filled with the smell of roasting chestnuts and smelly, grilled onions, hamburgers and sausages. We would watch the fireworks, warm our bodies by the bonfires and twirl sparklers. It was just a fun night for children and adults alike, although my father would probably beg to differ. So, back to this Toad in the Hole, it’s perfect for a Bonfire Night party or even just an everyday dinner at home. I’ve always wanted to have a Bonfire Party for my children, but there is always something else going on and for years now I’ve been lamenting to my husband about having a bonfire and party with lots of appropriate party food. One day. Until then, I just make this for dinner and we sit around our fire place. Place all the ingredients for the batter in the order listed into a blender. Whisk until completely blended and smooth. Can whisk by hand if needed. You can make the batter ahead and let it sit in the fridge. Preheat the oven to 425℉/220℃. In a 9x13 roasting tin, place the sausages and the oil, toss round to coat all the sausages. Place in the oven to brown. Once the sausages have browned, carefully pull out the tin from the oven. Pour the Yorkshire pudding batter all over the sausages. The batter will begin to puff up. Sprinkle the thyme leaves all over. Place in the oven and bake for 25-30 minutes, until the batter is puffed up and golden. Make sure the batter is cooked all the way through in the middle also. Check by inserting a knife; should come out clean. To make the onion gravy, caramelise onions in the butter. When they are golden, add the flour and cook a little. Pour in the chicken or beef stock and whisk until smooth and thickened. Enjoy this with its traditional accompaniments of mash potatoes, a green vegetable and onion gravy. Are there any foods you weren’t allowed or couldn’t eat as a child that you have reinvented in your own kitchens today? Nazeen, even if I am a bit late to the party, I still love this recipe that looks like absolutely perfect comfort food for the children! 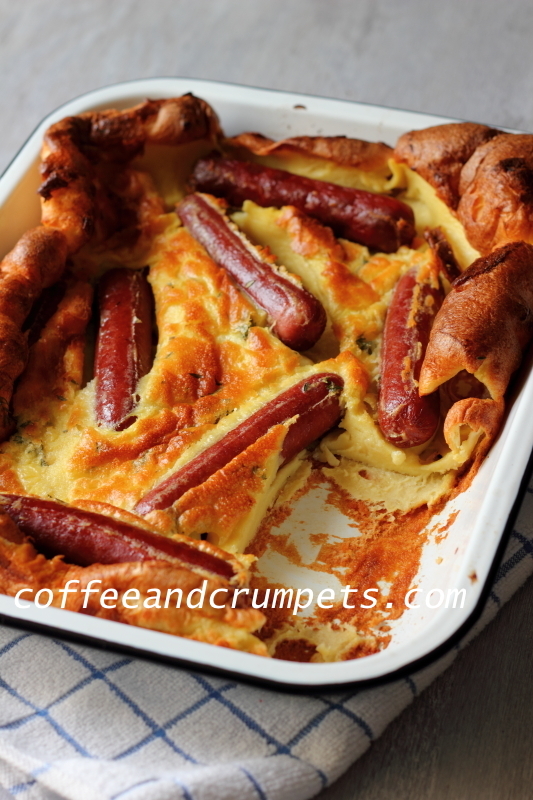 What a fun read this was today with a wonderful recipe – I like to see recipes on blogs that I have never seen on another blog before – although I have seen recipes for “Toad in the Hole” in cookbook, I never saw this dish featured in such a lovely way on a blog! Your toad in the hole looks brilliant! I have never made this dish before but I can imagine i to be delicious comfort food! This makes me want to run to the kitchen now! Yum!! cquek recently posted..French Toast – Home Made. Yay! Somebody who knows what this is!! Now, how come Oz doesn’t know Guy Fawkes but NZ does? Then again, I think Oz tries not to be too British?I love Bonfire Night, it used to be so much fun with fireworks and food. I really want to start doing that here for my children so they know a bit about GB. Really? They served this on a plane? Interesting. It must’ve been to get a rise out of people and peek their curiosity a bit :). It’s actually pretty tasty if you use quality ingredients. Hubby has spoken about this dish, but never tasted it. A very interesting dish though. I make yorkshire pudding quite often, it’s nice to see that base used to make this. Really interesting. Kids love this dish! Maybe your boys may like it? It is very easy and you can make the batter ahead and throw it together at the last minute. This is one of those dishes I’ve read about, but never eaten (or even seen). This is easy to make! I love Yorkshire pudding, so I know I’d like this. Great idea – thanks. I figured many people had heard about it but unless you’re in the UK, nobody had probably tried it. It’s really quite easy and tasty considering its just sausages and some batter. Hope you try it, John. I have never had Toad in the Hole and first heard about it recently watching a British mini-comedy called Posh Nosh. (It is VERY silly.) I think I would skip the toad part and just have the Yorkshire pudding. 🙂 LOVE that – my mum used to make it for all the holidays (never popovers), and it is wonderful! I am so glad to have your recipe! I love silly British comedies! I haven’t heard of that one though, where is it on? I’m like you, I eat around the sausage because I love Yorkshire puds. If you use a sausage you like, then this will be a treat for you! I don’t see any toads peeking out either, so you’re not the only one! Never had toad in the hole & will likely never have it on my travels so I wouldn’t mind whipping this up one evening. I’m sure my kids would enjoy this. Haha! Yes, your kids would enjoy this! Many time we have to adjust recipes to fit our guidelines, but it always turn out better! I’ve never had this but I love all the components. And this year our weather would have been perfect for a giant bonfire. Always wonder why they do bonfires at homecoming. That was always my favorite part! Bonfires always signified fall to me! Abbe@This is How I Cook recently posted..Gingerbread Pear Upside Down Skillet Cake and Three Winners! I’ve always wanted to do a bonfire here because the weather is perfect for it! Even if it means just lighting up my a Weber and standing around it! Man does does look good. Sausages in Yorkshire Pudding? Why have I never had Toad in The Hole????? And with onion gravy????? ohmy. And by the way, I had roasted Chestnuts for the first time on my trip to Germany. I’m in love with them. If you have favourite sausages then you would thoroughly enjoy this dish! It’s classic British pub food. Thanks Lea Ann, I hope you make it! I’ve never had this classic dish but I know I would enjoy it. Thanks Karen! I think you would enjoy it too. What a different and interesting dish, Nazneen! I remember eating a baked savory pancake casserole with sausage (that we called pizza) when I was a child in Brazil. It looks similar to this dish…although it was less flavorful than this one seems to be. Lovely thing is to see you sharing things from your home, England! Denise Browning@From Brazil To You recently posted..FBTY New Design, Logo,and Awesome Features… Plus, a $ 30 Giveaway!!! Thanks Denise! I’m sure it’s available in different countries under different names. It’s pretty tasty, especially with the onion gravy. Thanks for the info, GG! I knew you’d let me know how it was faring in the UK these days. Everything classic is making a comeback and is hip again! This was a dish that fascinated me as a youngster but I could never try it! I’m still not much for sausages or hotdogs though so I eat all the Yorkshire pud! I have never had toad in a hole. I don’t like the look of it, no offence daaahling. I don’t eat pork, so in the UK, this dish is off limits for me, so I like it that you used hot dogs. If you made it, I would try it, but honestly I prefer my hot dogs in a bun with mustard LOL… uncultured American that I am! My mother in law makes an Indian version of “sausage roll” which is pretty awesome. Its super spicy, and totally yummy. Not sure if you would like it though, as its got ground meat LOL :)… silly girl!